This new IPA from Moon Dog is another beer to graduate from the brewery's weekly single keg specials. 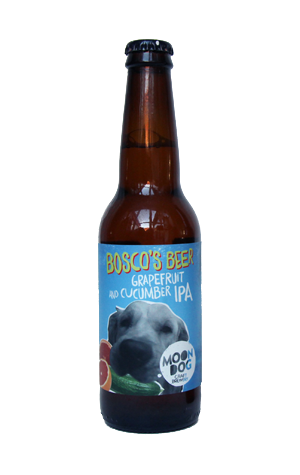 It was designed by senor brewer Adrian McNulty and is named after one of his dogs (pictured on the label with a fruity mouthful). As for why it's named after his dog, well, it's nothing to do with a canine love of grapefruit and cucumber, more a case of Adrian not having a name for the beer when the time came to tap the initial keg. From such inauspicious starts, however, came a beer that they deemed worthy of promotion to bottled release. The scaled up version saw the zest removed from a heap of grapefruits while 200kg of cucumbers were skinned and juiced. Both were added to the base IPA late on (indeed, there was no late hopping, just late fruiting and zesting). The outcome? Well, we're not experts in cucumber beer here but would suggest that their impact could be to add a gentle savoury element to the otherwise piney aroma, while we'd be more confident in saying that the grapefruit zest is responsible for much of the zesty, bitey, citrusy fruit flavour that's the beer's most striking character, aided and abetted by the US hops that also call the brewery's Old Mate pale ale home.